Old-fashioned gingerbread with lemon glaze. Humble and comforting, the perfect dessert for holiday entertaining. Serve with ginger whipped cream. I made gingerbread yesterday, with a lemon glaze and ginger whipped cream. Say Christmassy. Quintessential dessert this time of year. 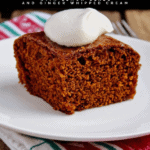 Years and years ago, back when I had holiday dinner parties, I served gingerbread for dessert. It was the perfect ending to the meal. Does anyone have dinner parties any more? While I’ve cut back, I had them all the time, and always at Christmas. Never ran out of reasons to have a party, formal or casual — St. Patrick’s Day, the Fourth of July, Valentine’s Day. Sometimes just adults and a formal table and three courses, sometimes kids all over the place. Great times, memories and food and drink. It seems I entertain less these days. Not sure exactly why not, but I do still like to have a Christmas dinner party with friends. I am not a big dessert person and always stress about what to serve. One year I decided to make a gingerbread. Old-fashioned, classic and definitely the season for it. It was simple and delicious, not too sweet after all the drinks and food. And it’s sort of an unexpected dessert, humble and comforting, and well, Christmassy. I first made this probably over 20 years ago in Chicago. The recipe is from The Silver Palate Cookbook. This is one of the first cookbooks I bought after getting married, I have made much from it. When I got the book out for this gingerbread, it opened right to the page, and my handwritten recipe for whipped cream with ginger fell out. The page is well worn. I love The Silver Palate Cookbook, not just the recipes, but the notes and quotes in the sidebars, too. This cookbook, more than any other, really inspired me to cook, and to cook better. 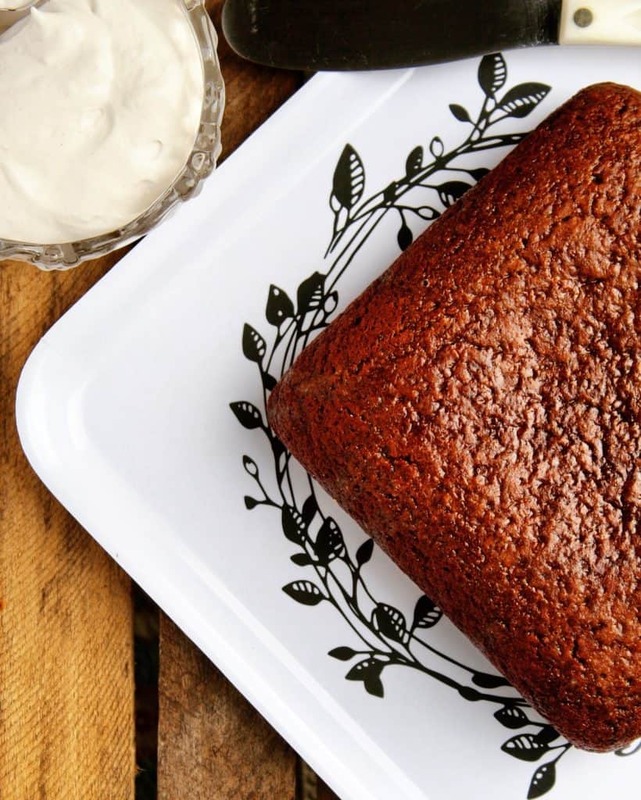 This is a classic gingerbread, like a gingerbread cookie but in cake form. Flavored strongly with ginger and molasses, and topped with a fresh lemon glaze poured over the top right out of the oven. A dusting of powdered sugar and a dollop of whipped cream, and you have the perfect dessert for your Christmas dinner party. 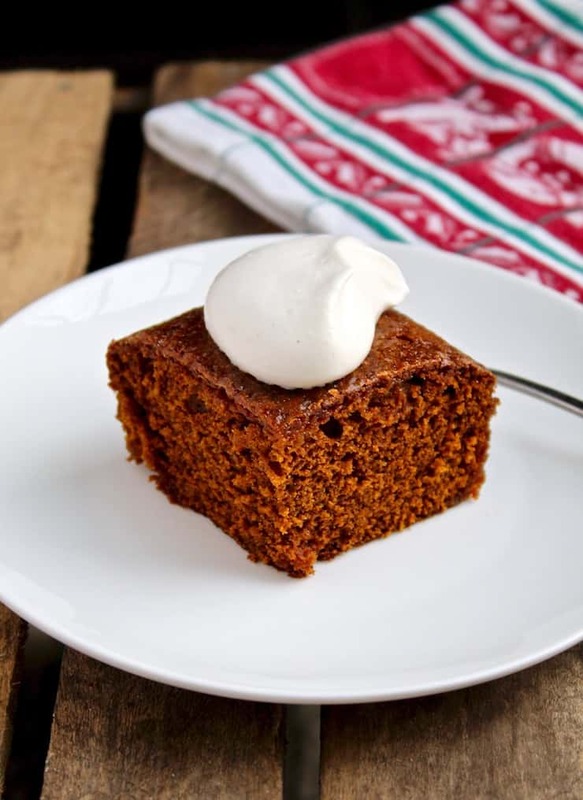 Try this gingerbread, your guests will love it. Other desserts and sweets for the holiday dessert table you might like are my kolachkes, peanut butter blossoms and buckeyes, all good year-round! 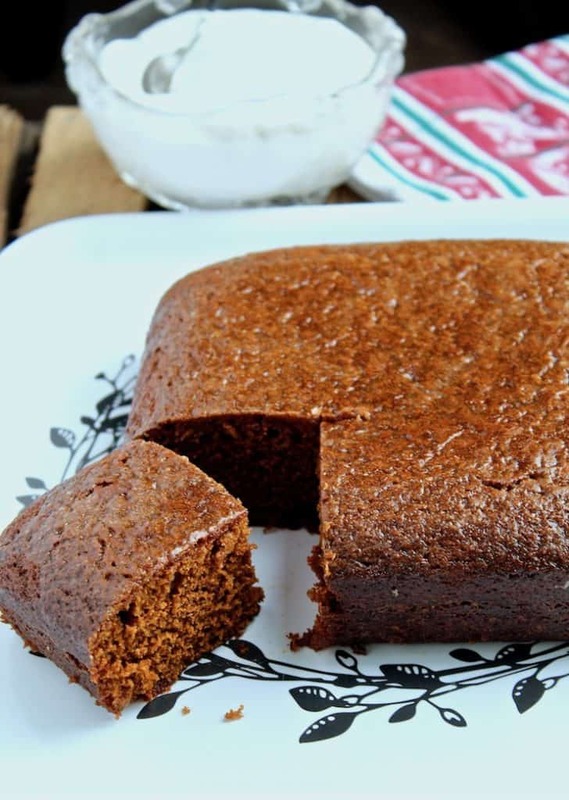 If you’ve tried this Gingerbread or any other recipe on the blog, then don’t forget to rate the recipe and let me know how yours turned out in the comments below ~ I love hearing from you! You can also FIND ME on FACEBOOK, TWITTER, INSTAGRAM and PINTEREST. Never miss a post ~ sign up for The Hungry Bluebird Newsletter for a weekly email of new content. Old-fashioned, classic gingerbread with lemon glaze. Humble and comforting, the perfect dessert for holiday entertaining. Serve with ginger whipped cream. Preheat oven to 350º. Grease and flour a 9-inch square pan (my pan was smaller, like 8-inch square and it was fine). 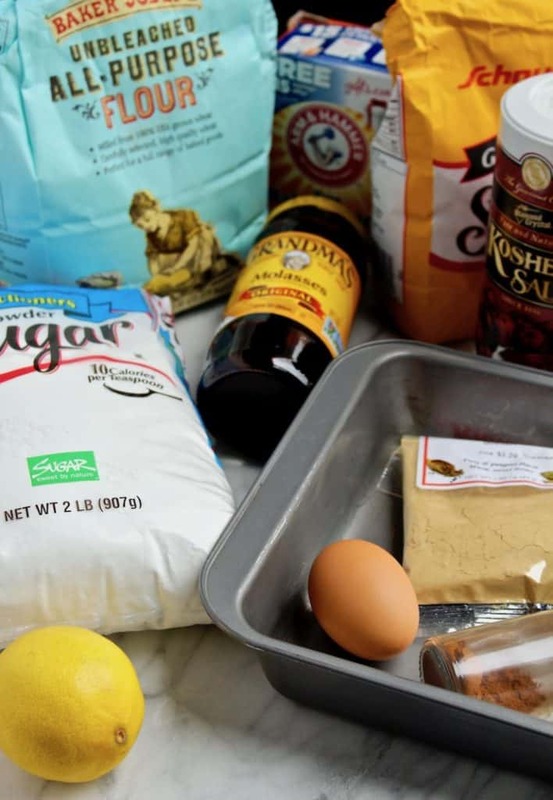 Sift all the dry ingredients into a mixing bowl, add the egg, sugar and molasses. Mix well. It will be crumbly and dry looking. That's okay. Pour the boiling water and then the oil over the mixture. Start with a wooden spoon, then switch to a whisk, and stir thoroughly until well combined and smooth. Pour batter into prepared pan, drop on counter a few times to remove air bubbles. Bake on middle rack in oven for 35 to 40 minutes. Cake is done when the top springs back when touched and the edges have started to pull away from the sides of the pan. While gingerbread is baking, make lemon glaze. Sift powdered sugar into small bowl, add lemon juice and mix well. Set aside. 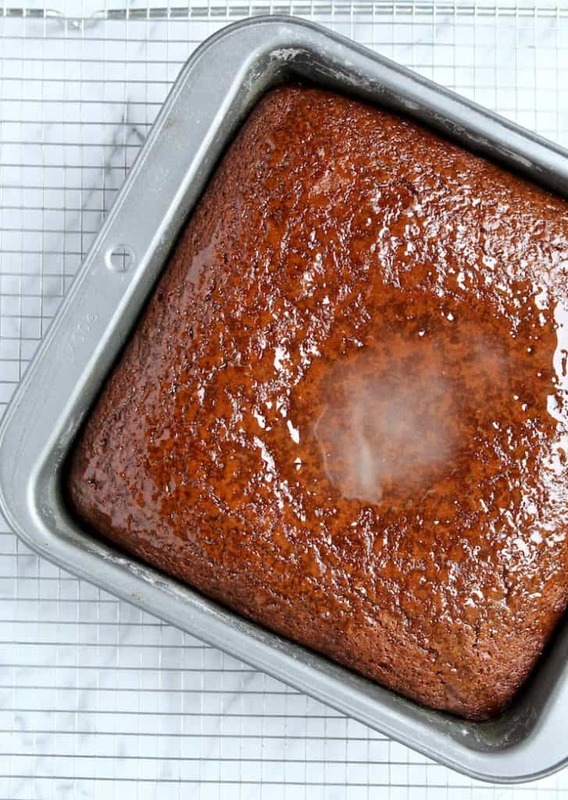 While the gingerbread is hot, just out of the oven, pour glaze over the top. Set on a rack to cool in the pan. To make whipped cream, put all the ingredients in a chilled bowl, and with a hand mixer with chilled beaters, beat whipping cream until soft-medium peaks form. Can be prepared 3 hours in advance. 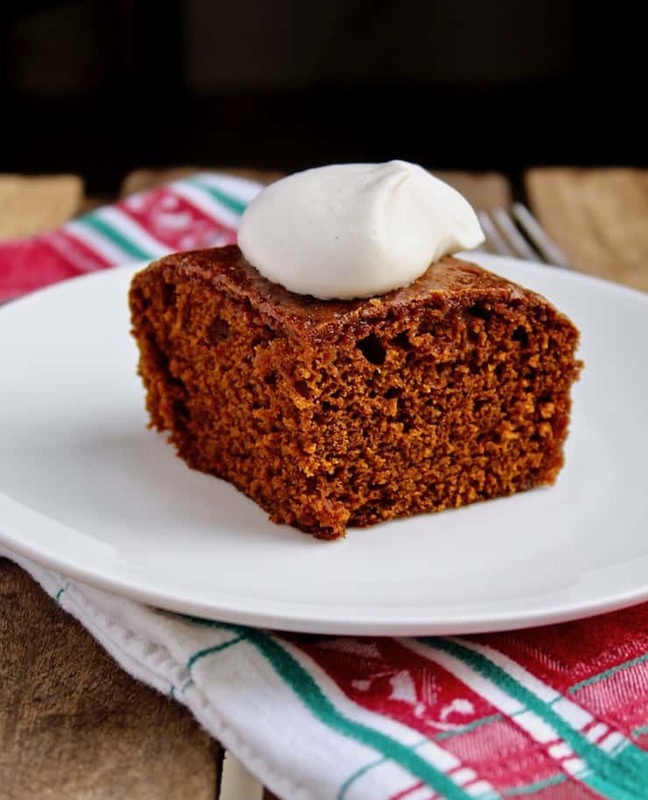 To serve, carefully remove gingerbread to a serving plate. Dust with powdered sugar. Cut square pieces and top with whipped cream. Maybe your best post ever! The photos, the writing, the love. It’s all there. I might just be the luckiest guy in the world.